Once you’ve decided you want to learn how to shoot a bow, you’ll definitely want the best beginner recurve bow on the market. 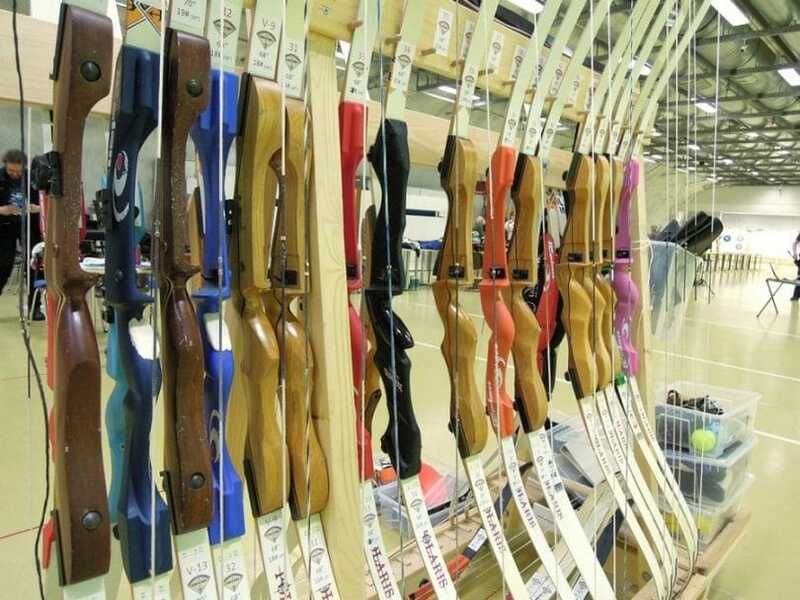 But getting that isn’t an easy thing since you’ll have a lot to learn about archery equipment and shooting techniques. Hopefully, we’ll make things easier for you by letting you know how to pick the right recurve and which factors influence your decision. Afterward, we’ll analyze five of the most awesome recurves on the market, thoroughly explaining exactly why each of them is a great novice bow. Draw length: This is the distance between the string and the riser when you draw the bow. So start by measuring the distance between the tips of your middle fingers when keeping your arms perpendicularly to the ground. Divide that by 2.5 to get the optimal draw length for you, and remember not to get a bigger draw length than what you can handle. Draw weight: Most beginners do fine with a 40-45 pounds draw weight, provided they’re adults with an average strength level. This will help them hunt small and medium animals. Kids and other adults should start below 40 pounds, but that only works for target practice, seeing as less drawing force entails less penetration force. Overall weight: Look for bows that are lightweight because you need to have a firm grip at all times. Too much weight might strain your muscles and make your hands shake, which in turn messes with the accuracy of your shot. 2-3 pounds is great for beginners. Overall length: Get a recurve that’s longer. You’ll need at least 58-60 inches AMO length so you can make sure the bow is stable enough. If your bow isn’t steady, you won’t learn how to take precise shots. Takedown vs. one-piece: We’d recommend that beginners start with a takedown bow because that’s what allows you to remove and replace the limbs. So once you get stronger and improve your shooting skills, you can get heavier limbs for more draw weight so you can hunt. Ability to customize: We think novices can really benefit from pre-installed notches that enable them to add certain extras. That’s not just for the looks, but for learning faster. So if you can mount a sight or a stabilizer, you’ll get more accuracy and shoot better. Included extras: We also feel that it’s better for beginners to buy a whole archery set that has all the necessary equipment included along with the bow. Therefore, you won’t have to search for additional gear and you can start shooting right out of the box. Silent, so they have more chances of shooting wild animals. Vibration-free, so beginners don’t receive a lot of shock on their hands to mess with their grip or to get them blisters. 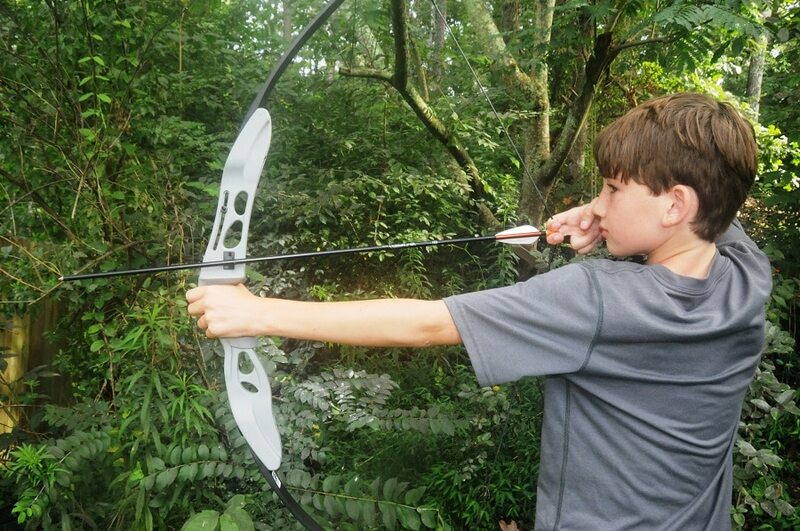 Built from strong and resistant materials, so the bow can be used years to come even after beginners become better, and increase their draw weight by replacing the limbs. Easy to install, meaning it has a stringer for adjusting the bow string, and its limbs can easily be attached to the riser. Appropriate for your dominant eye, which means you should either pick a left-hand model if you have a left dominant eye and you can easily pull the string with your left hand or conversely a right-hand model for the opposite situation. Brand reputation: This isn’t just for bragging, we honestly believe it’s better to buy from a trustworthy retailer rather than waste your money on a flimsy bow. That’s because reputable brands build and sell good bows, that really help you learn, and most of them are pretty affordable too. 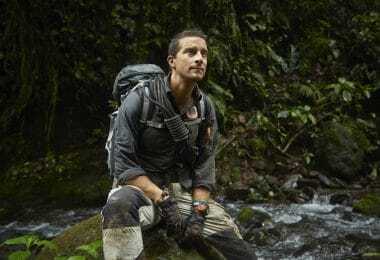 So it’s wiser to invest in a reliable recurve, rather than loose your time and money, maybe even injure yourself on a bow that’s a few bucks less. If you check the items below, you’ll see that all of them respect the requirements we’ve talked about till now. We’ll explain why each is great for a novice, so be sure to take your time reading. Description: This 5 stars and $220.49 Martin Archery Saber TD 40# Recurve Bow is intended for right-hand use, and it comes in an appealing black color. But even though that makes it look professional, it’s not what recommends it for beginner archers. Firstly, it has a draw weight of 40 pounds which is easy enough to handle and to employ by newbies. But you shouldn’t be a complete novice and it’s better if your strength is at least average, so it’s not a bow we would recommend for kids. This draw weight is high enough to help you shoot and kill small, maybe even medium-sized animals, but it’s also fine if you want to use it for target practice first. Its design renders the Saber great for all sorts of things, even bow fishing, making it a great tool for any sort of hunter, not just new ones. And since its brace height is 6.75-7.5 inches, you’ll be sure to make fast, accurate shots. The 64 inches AMO length may be regarded a bit over the top for beginners, but again, it’s not in the Youth category of recurves. We think that the longer riser is great for achieving better stability, which is definitely a plus for beginners. And if you use a very steady bow, you’ll have fewer troubles with the accuracy of your shots, which is an additional issue for some novices. The fact that it’s a takedown sort of bow is great for beginners too. It means you’ll be able to replace the limbs as it suits you. You can get limbs that weigh less if you’re not sure you can shoot a 40 pounds draw weight yet, or you can get heavier ones for later. Either way, the limbs that are now on the Saber bow are strong and reliable, made from wood. The riser is sturdy too, as it’s manufactured from metal. But these materials don’t add unnecessarily to its overall weight that barely reaches 3.4 pounds. That’s a sure plus for beginners who may need a light bow to start their archery training. Speaking about easy handling, it’s worth noting that this product comes with a Thermal V grip which dampens the shock your hands can feel once you shoot an arrow. The two VEM’s that are built-in on the riser will also reduce vibrations and noise, thus assisting your steady and accurate shot. But the reduced recoil may matter more for beginners, although its minimal noise making is a great advantage for all bow hunters. Lastly, we think it’s very important for newbies to be able to customize their own bows, which is why this recurve is great. So you’ll be able to add a sight and an arrow rest in order to see and shoot your quarry better, but you can also mount a quiver to carry your arrows at hand. Related: Martin Archery also offers this model in the Camo pattern. 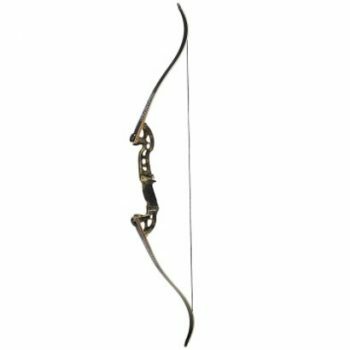 Description: This 4.1 stars and $199.99 camouflage Martin Archery Jaguar Elite 40# Bow is another product we’d choose for beginners, because of its construction. As such, it has a riser made from aluminum and the grip is very steady. So if you’re used to shooting with a gun, you’re better off starting with this sort of grip, rather than a really traditional one most purist recurve bowhunters prefer. And aluminum is known for both its low weight and sturdiness, which renders it reliable on the field. 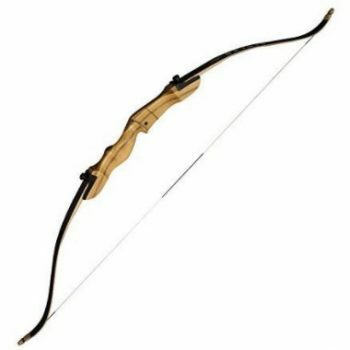 Besides, this bow is a takedown model, meaning you can remove its high-quality wood and fiberglass limbs to minimize the space you store it or carry it in. These sort of models are more versatile, although some may argue they’re also easier to damage on the field. Another good characteristic for beginners is the shock-reducing ability of the Jaguar. Minimal vibrations received from the bow string will make for a stronger grip too. 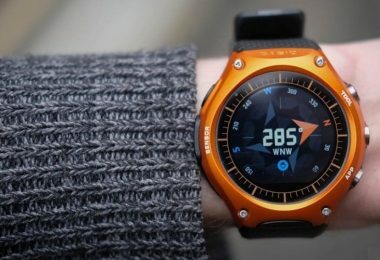 So the Thermal V-Grip is not just for reducing oscillations and noise, but it’s also good to go no matter the weather. And if you’re looking for a bow that can be customized according to your needs, to make it even more precise and easy to shoot, this is definitely it. The Jaguar has notches to insert a sight and an arrow rest, apart from a quiver, which will help you reach your target better and keep your arrows steadier on the bow prior to shooting. And since beginners may be more interested in shooting right out of the box, this recurve rises to the challenge. You just need to put in two screws for the limbs, use the included tool to string it and take it on its first hunting trip: the 2.6 pounds weight, 40 pounds draw weight and 60 inches AMO length render it great for newbies who want a light, yet powerful bow. Related: Martin Archery also offers this model in Black. 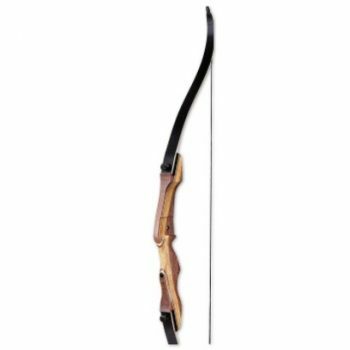 Description: This 4.6 stars Samick Sage Takedown Recurve Bow has a price range of $135.98 – $144.99, depending on the draw weight you’ll choose, between 25 and 60 pounds, each of which can be purchased with or without the stringer tool. Basically, that means you have a lot of options, and the versatile takedown construction makes it all the more appropriate for new archers. That’s because you can easily start off with a minimum of 25 pounds draw weight if you’re not sure what your strength level is. This weight will be enough to help you with some target practice at first, and once you get stronger and more confident in your abilities, you can simply replace the limbs with others that increase your draw weight. So you can get to a 60 pounds draw weight and be able to hunt bigger-sized animals in no time if you practice enough. But we don’t love Sage’s design just for its takedown feature. It’s also a very sturdy bow, manufactured from great materials. 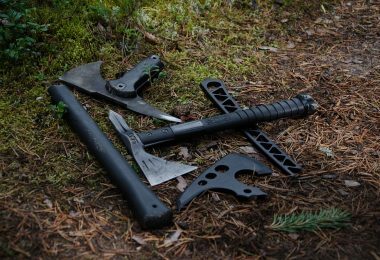 The riser is made with two types of wood, and the hard maple wood limbs are reinforced with black fiberglass for a better protection against damage. But though they’re high-quality, the limbs don’t cost too much so you can replace them as needed. The bolt construction helps in that regard too, as it hastens the whole process. And the replaceable limbs aren’t the only affordable element, the whole bow can fit many people’s budgets, though it’s a performant one. And you can make it even better if you use the preinstalled notches to add all sorts of extras you may use on the field. For instance, add the stabilizer to reduce noise and vibrations conveyed to the hand in order to make a more silent bow, with a firm grip. That’s not to say the Sage doesn’t have a steady hold, thanks to its molded grip. We like its strength and professional looking design, that’s courtesy of its two-color riser and black limbs with a shiny coating that renders it resistant to scratches. And although some people may say that the 62 inches AMO length is a bit too big for beginners, we disagree: the bigger the length, the more stable the bow, and that will account for a better precision of your shots. Related: Samick also offers this model for left-hand use. Description: This 4 stars and $175.00 Ragim Wildcat Takedown Recurve Bow Complete Archery Set is the perfect gift you could give a complete newbie who hasn’t shot a bow before, and it’s especially great for kids starting at age 8. That’s because it has all the things such a young shooter might need without having too much hassle finding the right extras later. And the accessories are high-quality too, not just there for the show. The first one is the black tube quiver, which is actually a quiver you can wear on your belt, made from vinyl leatherette and with an added hook. Though it’s smaller than a more advanced model, it can still hold 12 arrows with no problems, which is great for target practice. Plus, you’ll get four included arrows, which are made from fiberglass, with steel tips and feather fletchings, rendering them resistant and able to fly in a straight line. New archers will also reap the benefits of the instructions manual added, which gives out all the necessary information regarding the proper use of archery gear, apart from the proper form and sighting. You’ll even learn all the basic technical details regarding bow shooting too. The adjustable sight is yet another great plus since it can be set according to your purpose, it doesn’t weigh a lot, and it’s durable, helping you get more precise shots. The arrow rest is there for increased precision too, since it will keep your arrows steady and help you shoot them straight. This rest is made from plastic, rendering it resistant and light too. The finger tab manufactured from leather will protect the fingers of inexperienced archers, while also giving them a smooth release. Last but not least, you have an included stringer which makes setting up this bow all the easier. The quick setting can also be noticed when it comes to the removable limbs, which is another beginner-friendly feature. So this bow can be adjusted according to the level of strength and expertise of the archer, helping them grow thanks to the opportunity of adding heavier limbs for a bigger draw weight. That makes this whole set easy to practice on, more so since it has some included targets too. Plus, it’s a durable and strong equipment. Both the riser and limbs are manufactured with laminated wood and the 62 inches AMO length increases its stability, rendering the bow feel, look and shoot like the real deal. Since its maximum draw weight is 34 pounds, though, you can’t use it for hunting, but it’s a good place to start. 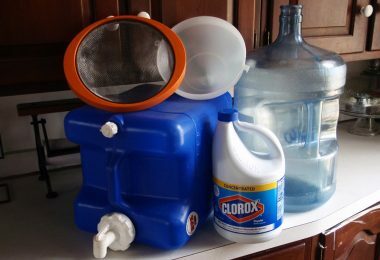 Related: Ragim offers this model in three draw weights, both for right and left-hand use: 24 pounds; 29 pounds; 34 pounds. 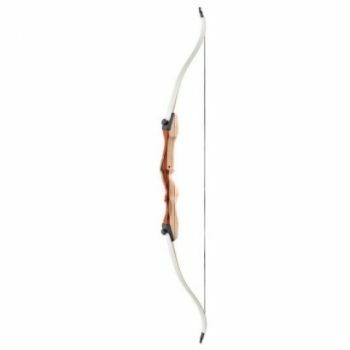 Description: This 4.5 stars and $99.99 SAS Spirit 62″ Take Down Recurve Bow is definitely something we’d recommend for beginners, especially kids who want to start their journey into the world of archery. That’s because the maximum recommended height for the shooter is 5’7”, which is how tall most kids and teenagers are. And it’s even a great model for smaller-framed women, who might benefit from learning how to target practice with a light, steady bow. The overall weight of 3 pounds is an additional argument regarding its ability to accommodate novice shooters. That’s because it’s low enough to render the bow easy to handle for longer amounts of time, without straining your muscles too much. 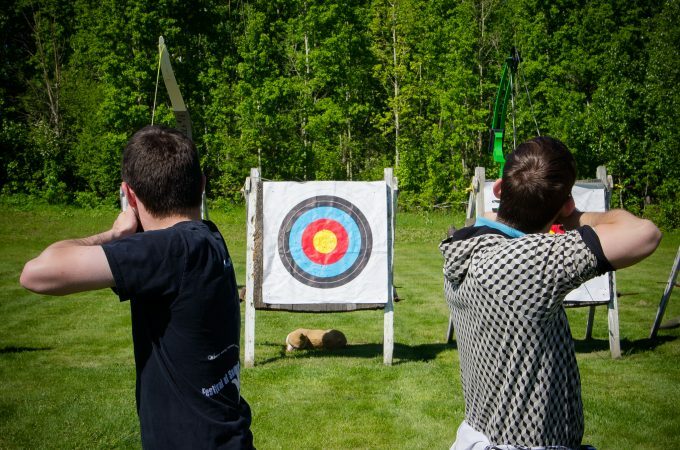 If a bow becomes tiresome to hold, the accuracy of your shots might falter too, which in turn messes with your ability to learn how to shoot right. The draw weight is likewise small since it’s only 22 pounds. That means you don’t need a lot of strength to draw this bow, but it’s also an indicator of how you’re going to use it: target practice. Since the force required to take the shots is small, the arrows won’t develop too much speed, nor kinetic energy to penetrate a stronger material than the cardboard of a bullseye. But hey, beginners need to practice first. However, take into account that this is a takedown model. 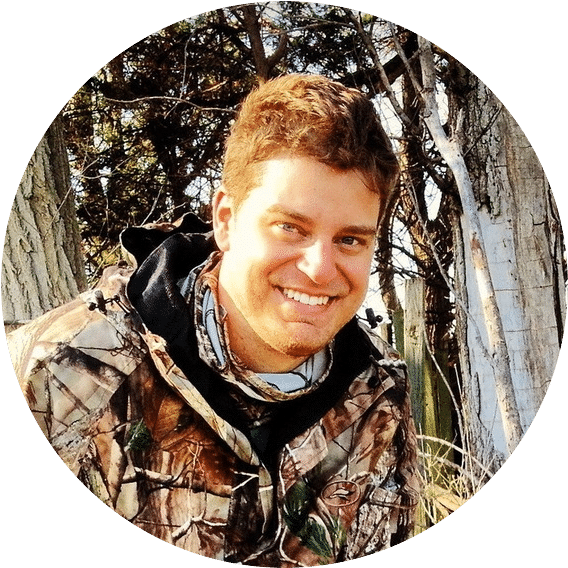 So once you learn how to shoot properly, you can easily remove the limbs and replace them with heavier ones that increase your draw weight and allow you to go on hunting trips. 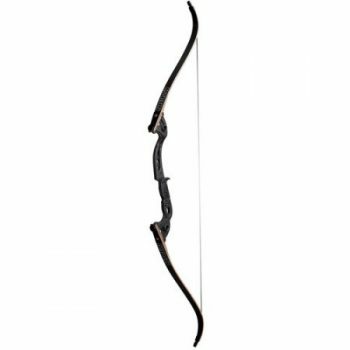 The 62 inches length of this bow will enable you to keep a steady, firm grip and take precise shots, just what a beginner needs. And once you progress and start hunting, this length will enable you to make humane kills in the wild. And be sure you’ll get there, especially since this is a durable bow that will hold you a lifetime. It’s made from great materials, like the three types of Asian wood for its riser, and the combination of maple wood and black fiberglass for the limbs. These are strong, resistant and lightweight, rendering this bow a timeless, yet modern look. Related: SAS also offers this model with various other draw weights: 18 pounds; 20 pounds; 26 pounds; 30 pounds; 34 pounds. We’ve tried to explain the ins and outs of recurve bows for beginners and offered you a top 5 of the best such products on the market. But if we’ve left something out, or if you still need some help deciding, be sure to drop us a line. Also, tell us what bow you end up choosing. Is it for you or for someone else? What helped you make up your mind? Why do you/ they want to learn how do shoot a recurve? Don’t be a stranger, the comments are right below.